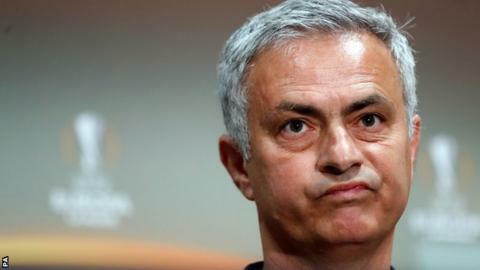 Manchester United will miss out on £50m if they fail to beat Ajax in the Europa League final on 24 May. The game in Stockholm is their only remaining chance of reaching next season's Champions League. Failure to qualify for Europe's flagship club competition for a second successive season would trigger a £21m penalty clause in their 10-year, £750m sponsorship deal with Adidas. United also expect to earn up to £30m more by being in the Champions League. The Old Trafford club's financial officer Cliff Baty said: "For us the bigger prize is Adidas and Champions League." The potential £21m loss of income from Adidas represents 30% of this season's anticipated £70m annual payment. It would be spread across the 10-year length of the contract, with £4.2m deducted immediately to cover the first two years of the deal, and £2.1m knocked off the payments for each remaining year. Baty said the winners of next week's game would get £6.5m, with the losers due £3.5m. Additional income from the Europa League market pool of between £7m and £8m has helped soften the financial impact of being in the tournament this season. United entered the competition as England's top-ranked team due to their FA Cup success last season. In addition, West Ham failed to get past the play-off round, Southampton were eliminated from the group stage and Tottenham were beaten in the last 32. The extra revenue is one of the major reasons why they raised overall projections for the year to between £560m and £570m when they announced third-quarter results, with profits of between £185m and £195m now anticipated. United's record profit is £191.9m. Baty said in a normal year, United would expect to generate between £40m and £50m in the Champions League compared to between £15m and £20m in the Europa League. Avengers: Endgame... is it any good?